The day finally arrived. 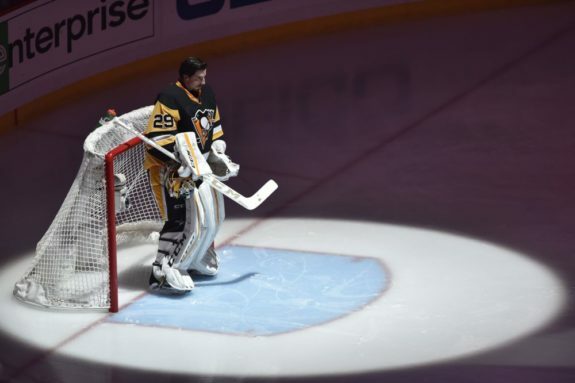 It was talked about for well over a year, but the much-anticipated departure of Pittsburgh Penguins’ goaltender Marc-Andre Fleury came and went last week. The Penguins will have to find a way to cope without their great friend and teammate. For Fleury, though, he couldn’t have landed in a much better place. Sure, going from the two-time Stanley Cup champions to an expansion team is about as big of a change as moving from the Steel to Sin City. But for one, he will still wear black and gold next season, and he’ll also once again be the centerpiece of an NHL team. The perfect fit for Fleury and Vegas only begins there. Fleury’s poor regular season in 2016-17 led many to believe he was now better suited for a backup role. A lack of regular playing time, though, easily explains the below average regular season statistics. This past season was the first time in his professional career that he didn’t receive a majority of the starts. Add that to the trade rumors from the summer and fall, and it’s easy to see why Fleury was off his game. After the trade deadline past, Flower Power returned. In his final seven regular season appearances, Fleury posted a .927 save percentage. He repeated that .927 save percentage in the first two rounds of the playoffs against the No. 1 and 4 teams (in terms of points) in the league. During those first two rounds, opponents outshot the Penguins in every game but one. Without Kris Letang, Pittsburgh needed elite goaltending to get through the daunted Metropolitan Division, and that’s exactly what Fleury gave them. Vegas selected a lot of defenders in the expansion draft last week, but it might take time for this team to gel. Furthermore, the Golden Knights are weakest at the center position, so offense could be tough to come by initially. Vegas is going to be counting on Fleury to be the team’s backbone, and based on his playoff performance, he’s clearly up to the task. In his final two regular seasons as a full-time starter, Fleury went 69-37-15 with a .920 save percentage, 2.30 GAA and 15 shutouts. This proves the playoff performance won’t be just a flash in the pan. But still, Fleury’s greatest attributes for Vegas will be his Stanley Cup experience and tremendous attitude. There could be a lot of games this season where the Golden Knights are outplayed and outshot. Don’t expect Fleury to complain. He’s always tried his best and when hung out to dry, he will expect himself to bail out his teammates. His experience in the playoffs will also be a great asset to the Vegas squad. They might not be in the postseason next spring, but Fleury’s a 14-year veteran that the younger players can gravitate to and learn from in the locker room. He clearly played a huge part in mentoring Matt Murray, helping him improve as a professional. 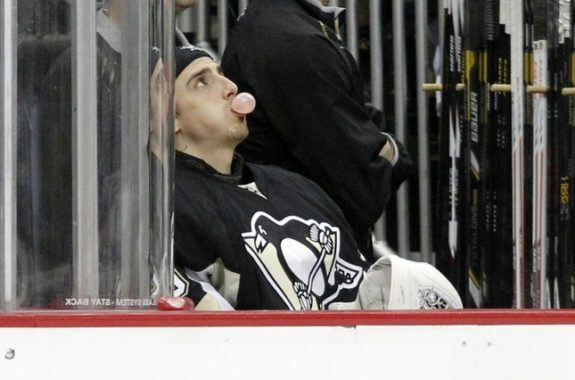 Fleury’s experience should keep the entire team on an even keel while his personality will keep players loose. His desire to have fun will play well in a city such as Vegas. There was quite a bit of talk that after selecting Fleury, Vegas would flip him for draft picks to a goaltender-needy team. It wouldn’t be the worst idea, but of all the veteran goaltenders Vegas could have landed, Fleury is the greatest fit, and the Golden Knights are better off keeping him. Most experienced goaltenders would probably hate going to an expansion team, but by all accounts, Fleury is embracing it. He told the crowd last week he wants to be in Vegas, and he’s already begun becoming a part of the community. That has to make owner Bill Foley very happy. Sure, he wants his young team to turn into a competitor, but first and foremost, he must build a fanbase and sell tickets. With all due respect to other guys such as James Neal and Nate Schmidt, Fleury’s ability to endear himself to a fanbase will make him the face of this new franchise. Early on, he could also be the main reason they win games. Fleury’s contract runs through the 2018-19 season. Maybe in the spring of 2019, he will be a viable trade option, but because he’s still in his prime, a great teammate and soon-to-be fan favorite, don’t be surprised if Fleury finishes his career in Vegas.